Barrington Lewis: Gas prices skyrocket...and so does speculation. There is ample supply of oil on the market. Economics 101 tells us that whenever supply outpaces demand, there will be a significant drop in prices to reflect the high supply and low demand. Because we have a lot of oil supply, the current price or any future speculative price of $5/gallon must quickly decrease. In 2008, people became frantic when gas hit $4/gallon and started trading their SUVs and trucks in for very expensive hybrids and the Toyota Prius. Obviously, there wasn't a "supply" issue then, and there isn't one now. How quickly we forget! 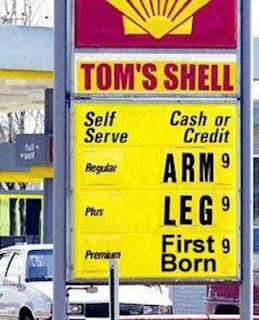 For those of you who remember - "they" predicted the same $5/gallon for gas then in 2008, just like they're doing now. In 2009, average cost for a gallon of gas fell from $4/gallon to just $1.85/gallon. The US economy is the largest in the world and consumes the most oil in the world. In other words, we're the oil producer's #1 customer. If our economy is in a recession, which means we're not buying as much oil, then oil producers are not happy. They want our economy strong and unemployment low. When the US is strong and people are driving to work everyday - the more gas/oil we consume. Typically, when oil reaches $130/barrel, the US economy is heading for a recession because things become too expensive for us at this level. The cost of food, utilities, clothing, and everything else skyrockets as gas prices escalates...causing our economy to tumble. As of this writing - oil prices are currently at $112/barrel. Financial speculation tends to create fear and/or greed (or "noise") in the markets and usually gets the masses frantic enough to do stupid things in reaction to this fear and greed. For example, consider in 2005-2007 when people were jumping to get into real estate by any means necessary (even if they had no money) because they thought "the prices are just going to go higher". Only to be stuck in foreclosure, bankruptcy, or constantly fighting adjustable rates in 2008. Remember how quick financing was available back then? But today, it's very difficult to get financing for anything in real estate. The same speculation is going on within the oil markets to some degree...where you have investors (institutional and individual) running to invest in oil at these high prices because "it's only going to go higher". Timing is everything, folks. Buying commodities or stocks just because the price is going up is ridiculous. Warren Buffet said it best - "Buy when people are cautious...sell when people are greedy." These are my reasons as to why the current high gas prices aren't sustainable because of the ample supply, the current unemployment rate, and just plain old speculation in the markets. So don't get too panicky because of the current prices just yet. Do what you can to survive....carpool, telecommute, walk, ride a bike, etc. Prices will soon turn for the better. If we went to war with Iraq to steal/take their oil (in- which we most certainly did), my question is why are these US Oil Co. tripple charge us(US Citizen) for this stolen oil. Its making them money. That's why their stock price is going up. My answer is to find other ways to get around and adjust my plans. The price will have to budge as demand weakens. It can be healthier this way too. more opportunities for our society if we could adjust our habbit. options to break our addiction? Or will we keep smoking. I think action takes some faith because we haven't seen what's next. You can buy a Education Fund from companies that you give a monthly contribution after ten years or so. Here's how I calculated to that is needed on college fund assuming you are sending your (future) kid to Harvard or Oxford or Standford, you will need at least $70,500 per year. You add 25% per each year for financial growth. This is due to possibility of Tuition hike, incidental, board and lodging, You will need a maximum of $300,000.00 to send your kid to a prestigous school. Now Lets all be realistic here... We can't send our kids to a well-known schoo when the parent is earning a combined income of $60,000 to $90,000. However there are education fund companies out there that if you allow yourself to contribute about $300 to $600 per each month for 15 years, it can earn up to $130,000 to $170,000 good for four years of college. Just make sure the fund can be refunded or transferable (which makes it harder) because of some kids whom you plan to invest with can decide not to go to college. This type of investment can be risky because you will never know if the company will last long to get your inverstment back or the child decides to go to a lower end of technical institution (unless of course its MIT), which the best decision is to use the maximum amount of payoff than nothing at all or half of its price. Why are the politicians who are supposedly working for the people allowing this kind of unnecessary price-gouging to continue??? Is there a real oil shortage??? I think not! The petroleum business made over $11 billion in PROFITS for the 1st qtr. And this comes at the expense of the tax-base as well due to many of these companies benefitting from Bush-manufactured tax breaks for corporations!! Gas prices will always hike... So what's the news about that.